The 11th annual Austin City Limits Music Festival took place this past weekend on the beautiful grounds of Zilker Park in Austin, Texas. 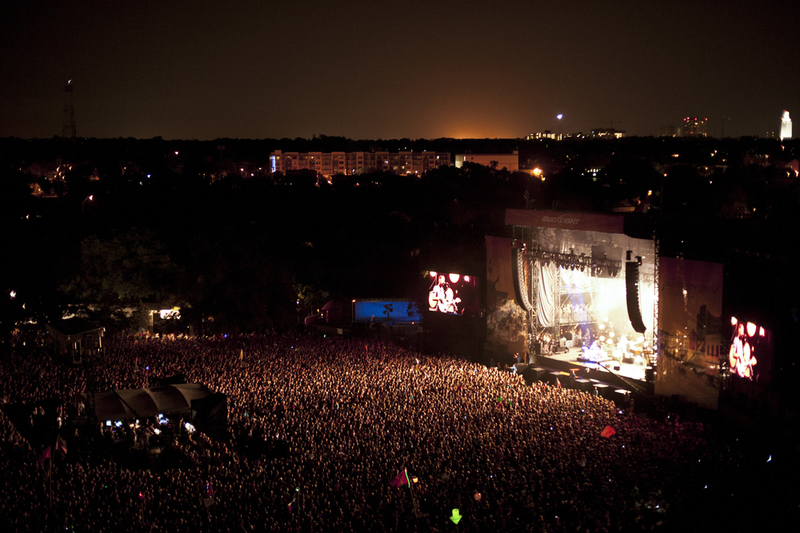 With a majestic backdrop of the Austin skyline, the festival played host to well over 130 bands and 75,000+ music loving fans each day of the event. 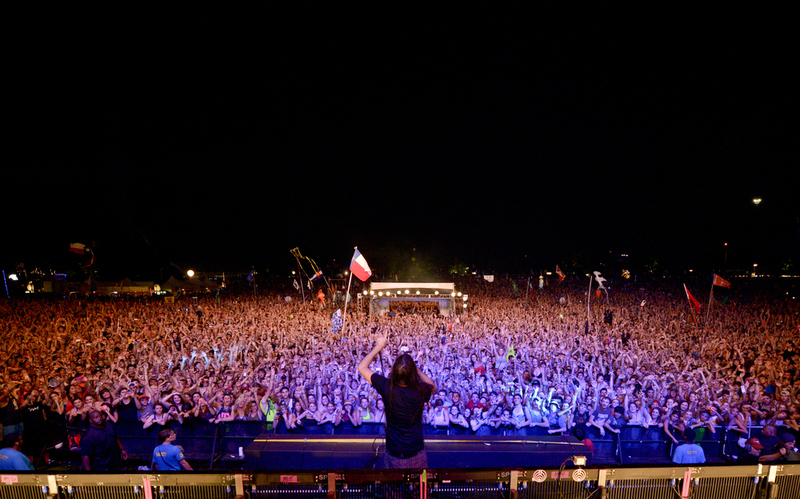 Looking at the lineup this year there seemed to be something for everybody, whether it was the blues rocking Gary Clark Jr., or the bass pounding sounds of electronic artist Bassnectar, ACL had it all. Not to mention the abundance of different food and various works of art festival attendees had to choose from. Day 1 Friday: We arrived on the festival grounds on Friday just in time to see the lovely duo of Tegan and Sara (will be here in Denver opening for The Killers next month). I always make an effort to get myself familiar with the festival grounds in anticipation of the running back and forth of trying to catch artist on different stages. We managed to drop by and say hi to one of our favorite DJ’s A-Trak, he had the Honda stage pretty packed for a late afternoon set playing his usual party anthems. Just across the lawn Weezer put on one of the festival’s best sets, with their all to familiar catalog of sing a long hits, the crowd belted out every word of their set. A band I continue to always be one step behind is Alabama Shakes, i made sure I arrived early enough to catch their set and was glad I did. Brittany Howard commands the stage with such respect exuding her soulful lyrics, a throwback to the glory retro-soul era of music. We also managed to grab a great spot to see one of the nights main attractions and most colorful performers the beautiful Florence Welsh and her band Florence and The Machine. Her elaborate stage setup complimented her performance to exact perfection in all aspects. Our night ended flip-flopping between Avicii and The Black Keys who closed out their respected stages in grand fashion. Best performance: Avicii: the electronic artist was only one of a few representing the rapid expanding genre of electronic music this weekend, but it is apparent that his headlining slot Friday night was well deserved. Already climbing the ranks of headlining status, the 23 year old Swedish DJ has had the dance floors buzzing with his blazing tracks and remixes all year long. Wish I had waken up earlier to catch set: First Aid Kit: last time we saw them was when they opened up for Lykke Li in Denver a few months ago. One of the more buzzed early set performances, we wont hesitate to catch them next time in Denver. Trends spotted: Boxed water, lace tops, TOMS shoes, flags of all shapes and sizes. Day 2 Saturday: The weather took a turn with scattered showers hitting the festival. One of the more talked about performances would have to be the back to back sets from Colorado's own Big Gigantic and Bassnectar's set on the Honda Stage. A younger demographic packed the stage to listen to the hottest electronic acts in the business today. Combine the hard beats and loud bass with rain pouring, it was a wet and muddy dance party. On the opposite side off the festival a rather calmer crowd got to enjoy a more subdued set from Andrew Bird on The Bud Light Stage. The Shins and Roots played at the same time making for an all out sprint from one end of the park to the other. Both veteran bands seemed to attract huge crowds on their respective stages. 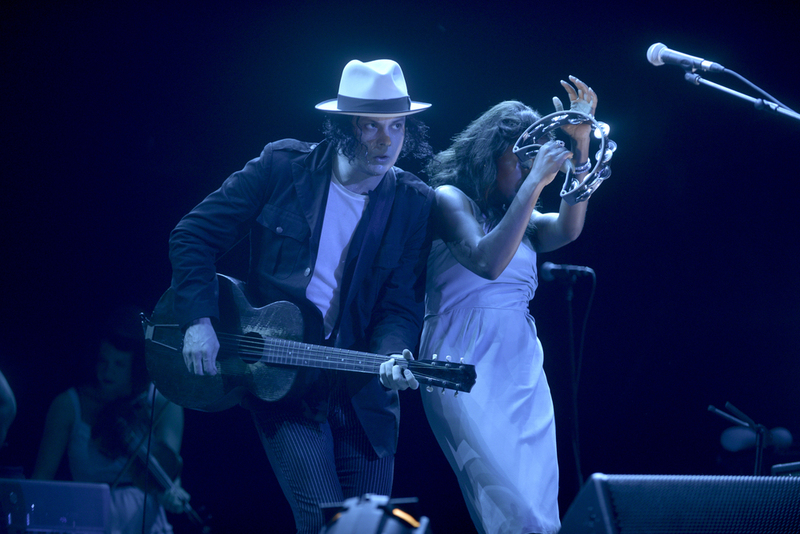 The rain gods seemed to show mercy for the night's heavyweight headliners of Jack White and Neil Young and Crazy Horse, both putting on epic sets to close out night two. Best performance: The Roots: the talented supergroup has come a long way, they manage to add a new component to their ever growing live sets year after year, anchored by Questlove on drums and Black Thought handling emcee duties their live element creates a sound infusing jazz, hip hop and soul unparalled by any other band. Wish I had waken up earlier to catch set: Oberhofer: takes a penchant for showmanship to a new level, it is always awesome to see musicians come into the crowd and perform (moreso during a packed festival), such was the case for Oberhofer giving the spectator a unique chance to get up close and personal with the band. Day 3 Sunday: The final day of the festival turned out to be the nicest in terms of weather. Our day started with the man who has played every festival on earth it seems, Mr. Gary Clark Jr. With his honky tonk blues, it was a perfect marriage for those die-hard Texans who have adopted the genre as the official music for the state. His talented guitar play is becoming legendary every time he plays and is garnering quite the fan base. Sunday gave us a chance to take in some of the homegrown talent based out of Denver including the talented Tennis who played to a huge crowd spilling into the main stage area. Also playing was overnight sensations, The Lumineers. Riding the wave of a hit single and underrated album, they managed to further expand their fan base with a great performance. Other notable performances included Childish Gambino, Iggy and The Stooges, and Crystal Castles. A perfect day to setup for the night's headliners and festival favorites, the Red Hot Chili Peppers, ended the three day festival on a high note. Next year the festival will expand to a two-weekend format giving fans other viable options to check out some of their favorite bands. Best performance: Gary Clark Jr., He continues to amaze with every performance and is establishing himself as a notable artist on the festival circuit; it wont be long before he is main stage material and giving hometown fans something to cheer about. Wish I had waken up earlier to catch set: Kimbra: played a rather early set on Sunday. With an infectious smile and great crowd presence it's no wonder she has become a favorite amongst her loyal following. 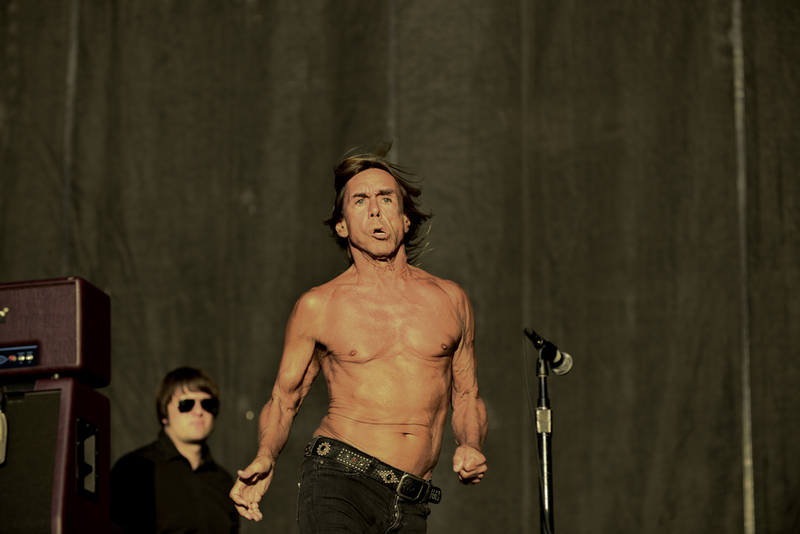 Trends spotted: Red Hot Chili Peppers t-shirts, those weird toe shoes, festival programs turned into fans.